Hot damn, a sunny day in December? I was feelin' it! 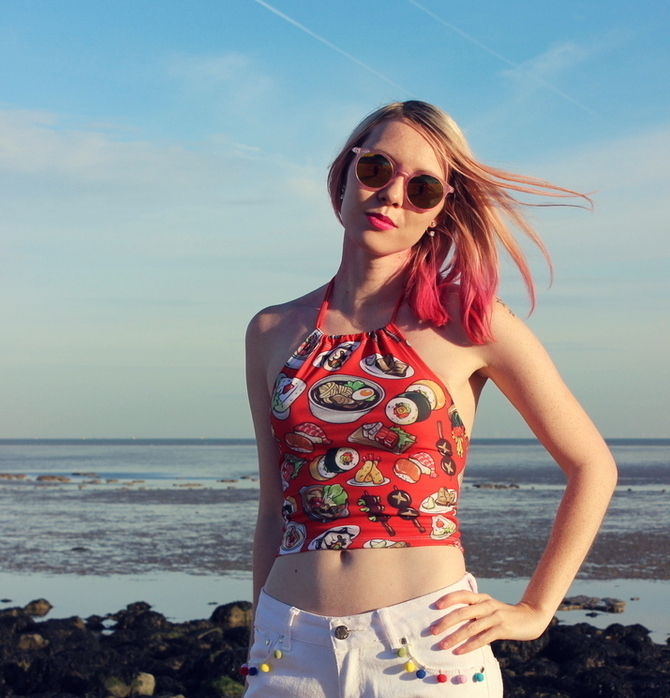 This sushi halter crop top from Minga London provided all the sushi steam I could dream up, and shooting on a seashell floor against a backdrop of bubbling rock-pool prisms served up a side order of mermaid majestic. Unable to restrain myself until summer summer summertime, I decided to rock these Liquor & Poker white jeans with pom poms and rips. Without a doubt Liquor & Poker definitely have to be one of my favourite brands. You may have seen these glitzy mermaid mom jeans in a previous post and I can't wait to see what sizzling, stunning dreamworks of denim they come up with next season. 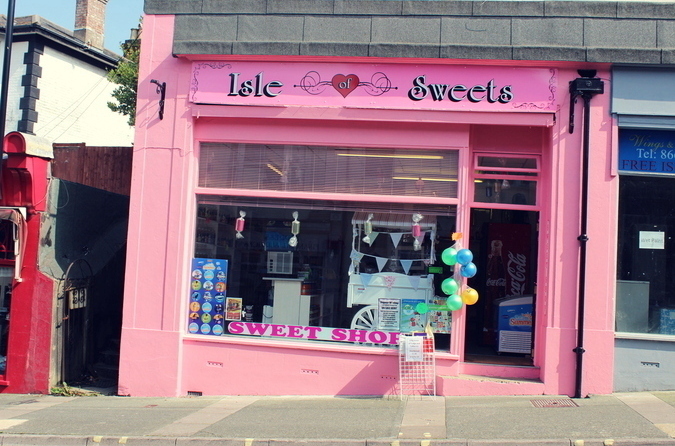 The rose gold wedge sandals were fabulous to crunch across the beachy coves in and of course to compliment the tidal vibes I got the candyfloss paintbrush out and went for red and pink ombre, a total mix of bliss. Our highlight of the shoot? Seeing two ferrets being walked along the shell shackled shores on leads. As we approach my birthday month and the glitzy galaxies of both Valentine's and Galentine's, I can't help thinking it's not that long till spring blooms; hurray for flower power. And then it's summer, you know, whatever. No big deal. Oh, if you hadn't guessed I quite like summer. A little. I'm waiting for the hotter months. Hell, sick and tired of waiting. And in other news, I finally finished the ending and epilogue of my first novel on Friday which I'm pretty proud of. It's not always been an easy road to veer through, but I feel blessed that so many people have my back, it really makes all the difference. Now I've completed the second part of my book I'll be rewriting the start and middle which I'm really ready for. The story has grown and developed so much and it took me a long while to figure out the ending. Now I finally have, I'm making sure the first part reflects the direction the story is going in, hence the rewriting. The start of the book sees the main character in a rock bottom state, there's a lot of highs and lows and I'm already getting in the right mindset to set things in motion. I feel the time is now to get this rollercoaster on the road. Here's to finally finishing it and getting it sent off in summer 2017. Are you a Liquor & Poker fan? What are your main 2017 goals? Congratulations on the novel progress- you're awesome! I would swim across the Channel just to steal all your beautiful clothes; serious wardrobe envy over here girl! Obsessed with that sushi top, and you paired it perfectly with your fab jeans! And those shoes ♥ Such a gorgeous look on you girl! Also congrats on finishing the ending and epilogue of your novel! MASSIVE YAY! So proud of you! Can't wait until you officially release it! You look gorgeous! I love the jeans,the top goes really well with it! I can't wait to read the novel! What a fun top! These photos are so sweet, and I love the pom-poms on your jeans! I desperately need to see ferrets being walked as well. I'm so proud of you! Your book is gonna be awesome! Also, I love that top, you always wear the funkiest, awesome clothes! <3! Love love love this outfit you've put together beaut! The little pompoms on the jeans are so cute and colourful, right up your street! 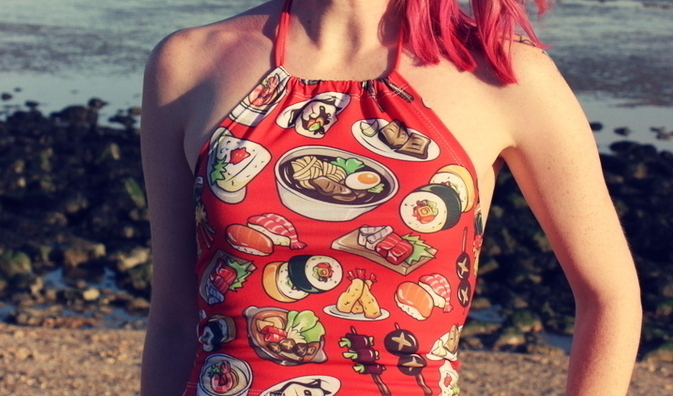 Teamed with the sushi crop is just perfect! You always introduce me to new brands and its great to discover them! So proud that you've got an ending for your book and are working your way though the start/middle re-writing! Go go for it! I can't wait to read the finished novel! Good Luck gorge! Sounds like your book is going well, that must be really exciting to see it all coming together. Bloody love that sushi top you're wearing too! Well done on reaching the conclusion of your first novel, I bet it's been difficult! I love this top so much, really fun and colourful as all your outfits are! Definitely can't wait for summer either and also, wish I'd seen those ferrets being walked haha. Aww I wish you all the best for your book lovely. I'm sure 2017 will be a brilliant year for you. More on the outfit... I love these jeans and everything about them! The top is my addiction all over haha! You're such a babe and a braver one too for going out in December like that. I too long for the summer and there's no way I'd be brave enough to be wearing so little on that beach lol!